Whether the pronouncement was made by Nietzsche or Altizer, there is no shortage of obituaries for God. God has been declared dead many times over the last several centuries, so another book on the death of God should not come as a surprise. Some of these declarations come from clearly atheist writers like Nietzsche or (more recently) Richard Dawkins, while others such as Thomas Altizer write out of a church background (Altizer was a professor of religion at Emory University and had earlier served as a minister in an Episcopalian church, planning to become a priest in that denomination). Common to these and other writers is an exploration founded on theology and its reliability. Eagleton then proceeds to back up his statement by exploring several movements throughout the last few centuries: the Enlightenment, Idealists, and Romantics. He then considers the crisis of culture that arose in the 1800s, the death of God as declared by Nietzsche and his successors, and the impact of modernism on religious and moral thinking in the 20th century and beyond. In each situation, he analyzes the premises of the movement and considers whether or not the basic ideas of that movement could serve as an improvement over the practices and behaviors of a people who follow a religion. Usually the comparison is made to the Judeo-Christian tradition, with a rare nod toward Islam; Eastern religions such as Hinduism and Buddhism are almost never considered. One interesting recurring theme in Eagleton’s analyses is the dichotomy between the thinking of the specific writer and what that writer feels “the masses” should believe. Often, there is an elitist attitude demonstrated: I can believe such-and-such, but it would not be good for “the masses” to believe this particular tenet. In some cases, the individual would hold to an atheistic view personally, but preach the opposite in order not to undermine the moral values of the common person. In addition, there was more than a touch of class separation, with a fear of stirring up political or social unrest. The idea of Nature was prominent, especially in Enlightenment thinking. During that time, the church as an institution was roundly attacked, primarily because of its heavy involvement in politics (and not so much because of its theology). Enlightenment thinkers turned to Nature only to find the design seen provided evidence of a Supreme Being. The supposed moral superiority of the Enlightenment came apart when the violence and bloodshed of the French revolution occurred. A shift in perspective came with the rise of the Idealists and the later Romantics. These thinkers moved away from a strong emphasis on reason and gravitated toward a reconsideration of religion in secular terms. The development of a secular Spirit that could yield individual freedom without the sterile constraints that the previous way of thinking did not allow. Both groups focused on the value of art and literature, with the Romantics moving more toward the rejection of absolutes. Nature, art, and imagination became the hallmarks of the Romantic movement. From there to a more obvious rejection of God was then not a challenging move. While Nietzsche declared himself to be the first real atheist, others had essentially come to the same position, but were simply not that transparent about their beliefs. As humankind moved into the 20th century, materialism and rejection of organized religion became more prevalent. Science gradually sought to replace God as the source of truth; however, a paradox is beginning to be seen. Influential figures in business, politics, and entertainment circles are coming to embrace a type of spiritual behavior that is manifest in the mystic rituals of the Kabbalah, occult practices, Eastern religions, and types of meditation. The practitioners simply do not let God get in the way but use these other approaches as a substitute. 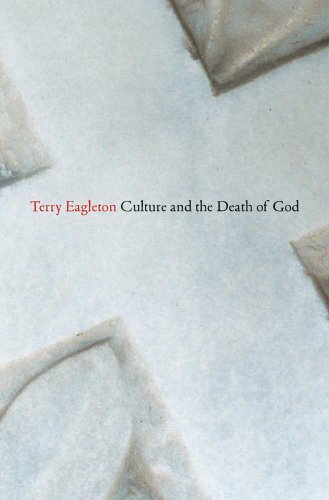 Culture and the Death of God is a challenging work, but has some shortcomings. If the reader is not intimately familiar with the works cited, it is very difficult to follow the time frame of development of ideas. A timeline would be of great help in understanding the trends described in their historical context. Eagleton’s treatment of Christianity is uneven and somewhat distorted. He describes the religion as one that is harsh and rigid, with a rather fatalistic approach to life. His picture certainly does not give an accurate view of the faith that transformed the world around it. The description of Jesus that Eagleton furnishes is also not in accordance with that of Scripture. His depiction is of a rather weak person who was “panic-stricken” in the Garden of Gethsemane. Yet the Bible shows us a person who knew his destiny and role, seeing God’s purpose in its fullness and being willing to offer himself as sacrifice for the redemption of humankind. Culture and the Death of God mainly describes the writings of influential thinkers of the time periods covered, but there is essentially no mention of how these works influenced the general population. A few allusions are made to the concerns of the intelligentsia about how their ideas might be received by “the masses,” but virtually no description of actual effects. Further left out of the conversation is discussion of the religious movements of the times, especially in the 19th century. The First Great Awakening in the U.S. (mid 1700s) helped produce the desire for freedom by the colonists and was a response to Enlightenment thinking. This movement was followed by the Second Great Awakening (into the 1840s), where a more hierarchical form of religion was largely supplanted by intense religious revivalism and an increase in democratic forms of church governance. Other revival and renewal movements followed well into the 20th century. Culture and the Death of God provides a unique perspective on the development of Western thought, exploring both the alternatives developed to replace traditional religion and the shortcomings of these alternatives.